Earlier this year, Cambridge Cycling Campaign succeeded in winning local council support for the setting up of trial “cyclist contraflow” signs in parts of Cambridge. 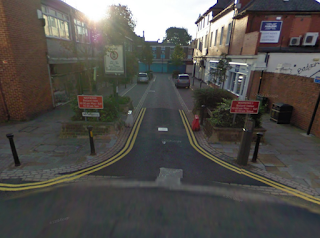 And as one of Darlington Cycling Campaign’s members pointed out to me today, Cycling England has been encouraging all cycling towns to make one-way streets two-way for cycling. Here in Darlington we have already asked officers on a number of occasions to consider this. One area where this is perhaps more urgently required, however, is at the Duke Street exit of the Pedestrian Heart. Here, cyclists who leave the town centre are confronted with a particularly narrow road outside the Coop Bank, a road that is designed to be one-way for motorised traffic. This picture shows the view from outside the town centre. This evening, on my way home from the station, I was cycling out of the town centre on this stretch when I noticed a car accelerating towards me and beeping his horn (at 8pm in the evening). He seemed in a great hurry. The reason soon became clear. He screeched to a halt before I was able to exit the narrow road into Duke Street to tell me off for cycling “the wrong way down a one way street”. Having obligingly opened his car door to tell me so, I hung on to it in order to inform him that, in fact, he was entering the Pedestrian Heart, an area in which cycling is allowed both ways. But this was not enough for my car-centric friend, who clearly believed he had the right to speed into the pedestrianised Skinnergate because the bollard had been lowered. Clearly, there is an education job to be done here. And what better way than to introduce, as is the case in many other countries, contraflow signs on one way streets. The usual safety “experts” will of course argue that “for safety reasons” this just cannot be introduced. But why is this deemed so unsafe, and ONLY in the dear old UK? Because we continue to pander to bad motorist behaviour, rather than developing an expectation of care when driving in built up areas. Contraflow cycling contributes to this. Look again at the picture above, and you can see a so-called “flying motorcycle” sign. This is supposed to signal a road that is two-way for cyclists, but not motor vehicles. But how many motorists understand this? Especially when there are time restrictions which run out in the evening. Perhaps more pertinent in this case is the question – why do motorists, other than commercial vehicles loading and unloading, require access into Skinnergate at all? Their only possible destination is a couple of hundred yards from this exit anyway. Would it not make sense “for safety reasons”, and indeed to save the NHS some money by encouraging a bit more walking, to simply keep motorised traffic out of the town centre altogether? I to have cycled up this piece of road to exit the “pedestrian heart” and have indeed been confronted by cars who wish to enter, but every time they have given way for me and I’ve given a friendly wave of thanks. I reckon you have been confronted by a driver who is in the minority and probably at most times when behind the wheel is – for want of a better word – a prat. Looking at the design of this part of the Heart, I reckon the council had decided to make a statement here; you are entering a pedestrian area, the “Funnel” a successful attempt to slow traffic before entering. I agree it needs attention to take into account cyclists leaving, and this would be an easy task to accomplish – looking at the road / Street to the right of your picture, the parking bay needs to be removed in totality and the rather nice flower bed reduced in width and a cycle track painted on. The parking area to the left must be left in place to take into account those amongst us who find walking / cycling difficult and need access, even though this type of parking gets abused. The "flying motorcycle" is signalling to drivers no motor vehicles “at the times displayed”. I may be wrong having not taken a good long close look at it, but believe there is no mention applicable to cycles. Then we have to run the gauntlet of Duke Street itself, which on a busy day is a nightmare for us two wheeled users. It needs to be “Full On” one way right from the roundabout at the top which would allow the vehicle lane to be reduced with contra flow for cyclists. I agree with this. Good comment. I can't make-out the 'flying motorcycle' sign from your photograph, but I believe it's on page 17 of "Know your Traffic Signs". It means no motor vehicles. That means cycling is permitted, but no motorised vehicles, unless modified by other notices, which appears to be the case. This junction is very badly 'designed', if 'design' was ever part of the process. There needs to be a realisation that under the current arrangement cars entering could encounter cyclists exiting and that there is insufficient space, putting cyclists at risk. Signage, road markings and the layout are all deficient. Far better to exclude cars altogether. Then the parking bays are no-longer necessary and restrict through traffic to bus and authorised vehicles only. Nice web site and that picture sums up a fair bit of "sillyness" we so often see. The book by the way is brilliant – Nice work, nice campaigning. When are we going to see "Jerald" deleted ???????????? The Cycling Facility of the Month is operated by the Warring Cycle Campaign, I have no connection with them. Although I thoroughly respect their efforts.